Rottweiler Herpes. Do I really need to say anything else? 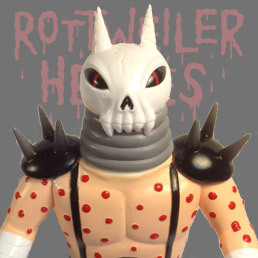 How could you not want a toy named Rottweiler Herpes? Ok, so maybe he does have a certain symbol on him from World War II that has added a bit of controversy to this release, but in all fairness it is part of his story in Johnny Ryan's Prison Pit comics, and this really is more a piece of art than something you'd give your kids to play with. Regardless of how you feel about that, there's no denying this is one of the best toy designs of the year. You can get this and many other awesome toy bros that Monster Worship made for San Diego Comic Con this Saturday, July 21st at 2pm eastern time. You have to go to http://www.monsterworship.com and hope I don't get everything before you do.